Write Shop, an incremental writing program, has recently released Write Shop Primary. This program has beginning writing instruction for young writers in early elementary (grades K-3). We recently completed Book A in the series and were excited to be asked to review Book B. Book B focuses on skills such as identifying the main characters in a story; writing a story with a beginning, middle, and end; writing a friendly letter; retelling nursery rhymes; and identifying rhyming words. This book contains 10 lessons. Each lesson is broken up into 8 activity sets which take you through the lesson objectives one step at a time. The first activity each day is a guided writing practice which is followed by the portion of the lesson. By the end of each lesson, the student will have produced a written work, done multiple guided writing practices with the parent, and completed hands-on activities. The first portion of the book explains how to use the program, how to structure the lessons, what supplies to have on hand, and how to schedule the lessons weekly. There are also tips for teaching children on different levels and how to set up a writing center. What did the program look like for us? We chose to streamline the program and try to complete one lesson every 2 weeks. This meant that we worked on Write Start 4 days per week. Day 1: We completed the Activity Sheet about a friendly letter and discussed the different parts of a letter. We also wrote our own friendly letter to grandma. The activity was to create a garden of rhyming words with word families. The middle and ending of a word (-at) is written on the center of a flower and then the student cuts out petals to put around the flower. On each petal is written a beginning letter that would complete the word (cat, bat, mat). Curly did not want to do this activity so we put it away for the day. Day 2: We began our lesson with a guided writing practice. During this practice I ask Curly questions and guide her as she completes her writing assignment. The guided writing was to write a friendly letter. Then we were to read back over the letter and note all punctuation used. The lesson suggests using a pointer but since I’m not a classroom type teacher and I only have 1 student, I can’t bring myself to use a pointer. My finger works just fine : ) Next we were supposed to read a picture book about a child’s or animal’s trip. With as many read alouds as we have going each week, we didn’t add in any more. Lastly we were supposed to do the friendly letter boogie (motions to help us remember the parts of a letter) and then look at postcards. Curly was not into the boogie and she gets lots of postcards from grandma so we’ve discussed them many times. Day 3: The first part of the lesson guided writing practice of another friendly letter. Then we were to brainstorm topics to write about for a letter to practice brainstorming and narrowing down ideas. Curly was frustrated that we wrote a letter and then brainstormed ideas for writing a letter. It felt very redundant. Day 4: On this day the guided writing of a friendly letter is optional. We skipped that part. The assignment this week was to write a friendly letter based on our brainstorming session. Curly was really beginning to complain about writing yet another letter. Day 5: This day begins with a guided writing of a friendly letter. Then the lesson instructs you to grab a stuffed animal for an editing buddy. I was to read over the letter and make sure it contained all the necessary components. However, since Curly and I wrote the letter together, we edited as we went and checked our work after. So, there weren’t any real changes to her letter when we finished. Day 6: The lesson is another guided writing practice of a friendly letter. The next part of the assignment is to complete the back of the activity page-which is to write a letter. But we had already done this on Day 1. We skipped this day. Day 7: The guided writing for this lesson was a friendly letter. Then the activity was to copy our finished letter from Day 4 onto stationary to get it ready to mail. Curly did not want to recopy a letter she had already written so we simply got our letter ready to mail. The lesson suggested taking a field trip to the post office to mail the letter. You can’t pay me to go to the post office, so we took a field trip to the mail box and Curly even put the flag up. Day 8: The guided writing of a friendly letter was optional today. The activity was to assess the child’s work for content, punctuation, and spelling. Then the lesson suggested discussing emails and allowing the child to send an email. I think we skipped this day as well. Want to know what we thought about the program? This program makes writing hands on with activities and encourages the parent to read books with the child and have discussions about the structure of the story. It covers more than just writing; it also introduces simple literary analysis, spelling, and vocabulary. This program takes the student through a step by step process, guiding them to complete simple writing projects. The steps are clearly outlined and explained for the parent, making the program easy to facilitate. There are many extra components to the program that are recommended-finding picture books, using pointers, creating projects, publishing each project in a different way. The program requires quite a bit of prep work to make sure all components are on hand before beginning a lesson. The guided writing practices are the same general topics for each lesson and there is one in every lesson. They are considered an integral part of the lesson but some students may find them tedious and repetitive. The program introduced many styles of writing as well as other literary topics such as describing characters and identifying the beginning, middle, and closing of a story. Some of the hands on elements were enjoyable, but Curly found many of them to be too time consuming. I felt like writing time sometimes became project time and the focus shifted away from practicing writing skills and toward completing the projects or adding details to the published work. The hands on element seemed to distract Curly from the purpose of producing a well-written work. The guided writing exercises were tedious for both of us and I often changed the topics drastically in order to increase her interest. We had so much complaining about this. With the way I tweaked the topics, skipped guided writing practices, and left out many of the craft projects and activities, I realized the program might not be the perfect fit for us. I think we need a writing program that is more straightforward and simple, without added projects or crafts. Curly enjoys writing and doesn’t need the extra activities to motivate her; they actually prove distracting to her. She also prefers more variety and the freedom to be flexible without multiple guided writing practices on the same topics. This program would work well with a child who doesn’t enjoy writing or who struggles to formulate creative and imaginative ideas for storytelling and writing. The activities would motivate a hands-on learner and make writing more enjoyable for a child who doesn’t enjoy the physical act of writing since the writing activities are broken up with crafts and hands on activities. 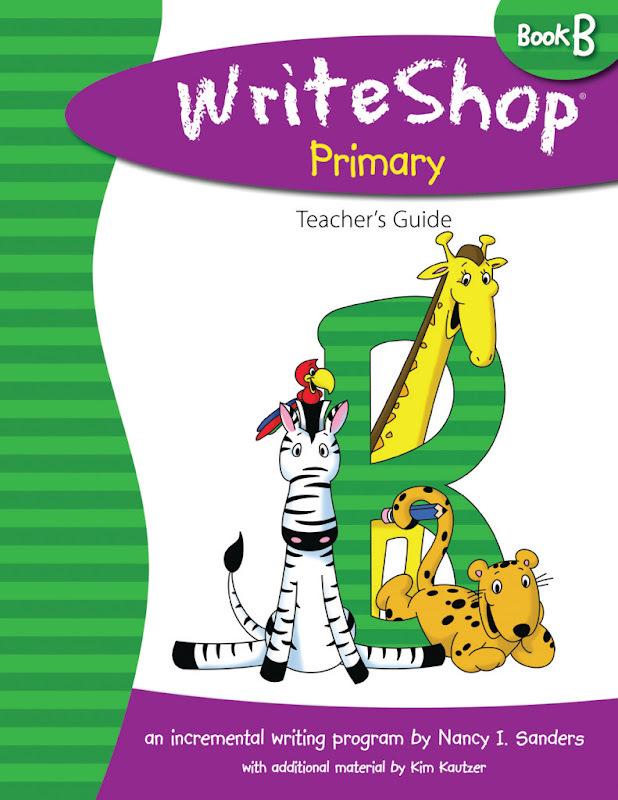 Write Shop Primary retails for $29.95 for Book B and the activity packs (worksheets) that correspond to Book B retail for $4.95. An E-Book version of Book B can be purchased for $26.95. You can view the scope and sequence here and sample lessons here. And for all my blog readers, Write Shop is generously offering a 15% discount on all Write Shop Primary and Write Shop Junior Products. Just enter coupon code CREW15 at checkout. This offer is valid through June 15, 2012. See what the other TOS Crew members though of the Write Shop products here! Thanks for the review. I kept looking at these for our homeschool next year, but was pretty reluctant to take the plunge. Your review has really helped. I'm not sure we are up for something that has a bunch of extra projects. I would prefer something that focuses more on just writing and grammar. I'm glad it was helpful! It's a fun program but it required too much work for us. We needed more focus on just writing. So, I'm still looking around at our options.